Alfred Hayes was born in August of 1928. As a youngster this phenomenal athlete trained in the art of Judo alongside fellow legends Joe D'Orazio and Steve Logan, where he was to become the youngest man in history at that time to gain a black belt in the sport. Following his Judo success Alfred was trained in the sport of professional wrestling by Sir Athol Oakley making his in ring debut in 1950, he quickly made a name for himself with classic bouts with the likes of Bert Assirati, Mike Marino and Dr Death. 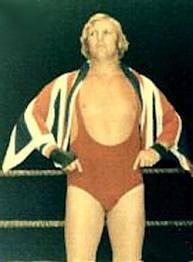 During this time Alfie and his then tag partner Ray Hunter helped to introduce tag wrestling to Europe from the USA, this form of wrestling became so popular that the pair were able to command huge salaries. Throughout the 1960's as 'Judo' Al Hayes he had a successful run as the British Heavyweight Champion defeating his trainer and mentor Sir Athol Oakley for the strap. The next phase of his illustrious career saw him turn to Promoting working alongside Paul Lincoln with whom he filled halls all over Britain. By the early 1970's Alfred had achieved all he could in Britain and set his sites across the pond to the USA. During the 1970's he made an astonishing impact on the business in the USA claiming many of the NWA's top titles in the process. In 1982 Lord Alfred Hayes made his debut in Vince McMahons WWF however only a year later was forced to retire from the ring due to severe Arthritis, brought on by years of wrestling. He eventually re-signed with the WWF as a Manager and Announcer managing some of the top teams of the time. His career highlight as an announcer came when he called the main event match of Wrestlemania 2. Throughout the 1980's he was a permanent fixture on WWF programming conducting interviews with all the major names of the time such as Hulk Hogan, Randy Savage and the British Bulldogs.